Thermoplastic ionomer materials such as Nafion do have many talents: they can be used as membranes for proton exchange in fuel cells, but they have also attracted attention as shape memory materials: Via external stimuli such as heat or an electric field, it is possible to trigger a change in shapes. Applications in textiles, biomedicine, aerospace, sensors and coatings are possible. 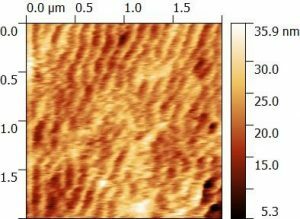 Topology of Nafion revealing the internal shape structure measured by atomic force microscopy. Nafion is one of those materials: as a membrane in a fuel cell, its high proton conductivity allows a fast pass of hydrogen ions (protons). And its internal shape plays a crucial role. Now a team from Brazil has analysed at BESSY II which processes occur during the relevant phase transition from one shape to the other. This could even lead to printing materials, which are able to change shapes with time, the so called 4D printing. Dr. Ribeiro de Matos, which kind of materials are you working on and why? Bruno Ribeiro de Matos: We work with polymers that contain ions, so called ionomeric polymers. Several companies and research groups worldwide have developed ion-containing polymers for diverse applications. Among them, polymer electrolyte fuel cells and 4D-printing, which means: Printing materials which are able to change their shape by an external stimulus such as temperature. What did you want to find out? Bruno Ribeiro de Matos: Some ionomers from the perfluorosulfonate ionomers’ family (PIMs) display the highest known conductivity among solid proton conductors. But we do not understand yet why such high conductivity is possible – what are the underlying mechanisms, which enable those ions to hop along in the polymer matrix. Such a deeper understanding could allow us to design novel high-performance ionomers. How did you proceed to get more insights into these materials? By heating above 120°C, the Nafion-polymer-rods contract and ionic crosslinks are switched. After further heating >140 °C the rods become a sort of messy coils. This is reversible. Bruno Ribeiro de Matos: Our group at IPEN is working together with HZB researchers Dr. Lili Puskar and Dr. Ulrich Schade at BESSY II. We used two different methods and combined the data. One is far infrared spectroscopy (FIR), the other method is broadband dielectric spectroscopy (BDS). Both provide information on the ion-hopping among different length scales of the ionomer matrix. We studied our samples in a wide range of frequencies, from very high frequencies (~1012-1013 Hz) to the far infrared (FIR) in which the vibrational motions of ions take place, and within the low frequency range (~10-2-107 Hz – BDS) which reflects interactions between ion motions and the polymer network dynamics. What did you hope to learn from the experiment? Bruno Ribeiro de Matos: Previously, it was demonstrated that some intriguing properties of ionomers were deeply linked to a so called α-transition. For instance a “memory of shape”. The origin of the α-transition, however, is obscured, since many interdependent processes take place. With our experiment at BESSY II, we found a connection between the shape of the ionomer building blocks, the dynamics of the ionic network and the mechanical and conduction properties. We believe that this is a rule of thumb for the selection and development of high performance ionomer materials. Which results are really new? Bruno Ribeiro de Matos: Both FIR and BDS measurements were performed in conditions not explored before. There was a very good match between FIR measurements and BDS, in which the first indicated the thermal behavior of the electrostatic interactions among aggregated ionic groups, and the later showed that the shape of such ionic aggregates transits from a rodlike to a coiled conformation. This happens at a critical condition specified by the relative dynamics of ion-hopping and charge-polarization. So we understand now that the proton conductivity is not only dependent on morphology, but on a relationship between the relaxation time for charge-polarization of the ionomer chains and the relaxation time for ion-hopping. 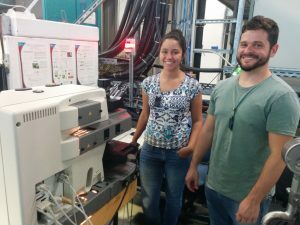 Bruno Ribeiro de Matos and PhD-student Jaqueline da Souza at the IRIS Beamline. Jaqueline was a summer student at HZB in 2017. What are possible new applications? Bruno Ribeiro de Matos: These ionomeric materials “speak” directly with the fuel cell community. However, our results are of great interest for other research topics too, such as artificial muscle design, electrocatalysts but also 3D and 4D printing. These materials have been pointed as high-performance materials for 3D printing. 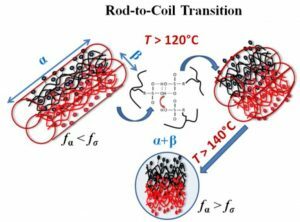 Such ionomers possess an interesting property not found in conventional polymers; they have the ability of memorizing different shapes that change over time when the appropriate stimulus is applied, such as heat, humidity, electric potential. This so called shape memory property adds another dimension to the final product: time (4D printing). It can be used, for example, as a food packaging material that are able to shrink once being allowed to heat when removed from the supermarket refrigerated shelf, thereby protecting the food. Bruno Ribeiro de Matos: We have performed all the characterizations of the samples in the dry state, because the presence of water increases the complexity in understanding the data. Now we can move forward and carry out our experiments for samples in the hydrated form and with different degrees of ion content. The investigation of the ionomers in the humid state is a preliminary step towards understanding the role of a solvent in the dynamics of the relaxations and the shape of the ionomer building blocks. This development is considered a key step for advancing both polymer electrolyte fuel cells and 4D printing technologies. Thank you and see you again at BESSY II! The results are published in scientific reports (2018), the nature open access journal. Interplay of α/β-Relaxation Dynamics and the Shape of Ionomer Building Blocks. Jaqueline da Souza (today PhD student at IPEN) was a summer student at HZB in 2017. 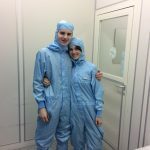 In her short blogpost she describes her summer project at HZB on Nafion.